The Paws Aboard Double Designer Doggy Life Jacket is undoubtedly one of the best ones available in the market. 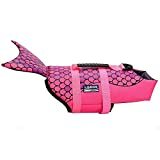 It offers you with the ability to keep your pet safe as well as afloat in or around the water by providing you with maximum buoyancy as well as visibility. It comes with underbelly drainage as well as drying with the help of advanced mesh. Thus, it makes your dog completely comfortable and keeps it healthy by eliminating the chances of exhaustion. Here is another great product from Paws Abroad. Dogs get tired too while in water thus the risk of drowning is always very high. However, with this life jacket you can ensure utmost safety for your mooch. Manufactured with advanced reflective strips as well as bright colours, this life jacket from Paws Abroad provide you with complete visibility. Furthermore, it has an innovative design that features nylon straps, velcro and handle on the top to keep your pet completely secure. Lastly, it also features a highly advanced drainage system that makes the drying process fast. This product is exceptional in terms of style as well as safety. It features a camouflage print that is highly appealing to dogs as well as the owners. Plus, it features a ultra-durable velcro that can be adjusted easily as per the size of your dog. Furthermore, it comes with reflective straps and accents that increases the visibility of your dog. The top handle that this life preserver jacket comes with helps you to easily manoeuvre your dog. 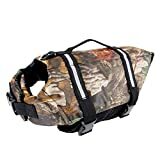 The Outward Hound Granby Dog Life Jacket comes with highly durable dual grab handles constructed from a ripstop material which does not restrict your dog’s movements. Furthermore, the life jacket offers maximum visibility with the help of bright orange colouring as well as reflective striping. It also features buckles and chest straps that makes sure that your dog remains safe. Lastly, this life jacket has a neck float that helps in keeping the head of your dog above water. Manufactured from durable neoprene and EPE padding of high density, the Pawaboo Dog Life Jacket provides your dog with buoyancy and great mobility in water. It also comes with front head support which keeps your dog’s head above the water. Plus, the heavy-duty hook as well as fastening loop system which keeps your pet completely secured. The best thing about this life support jacket is that it offers easy fit as well as extreme comfort with the help of adjustable strap. Your dog also remains completely visible thanks to the reflective straps that the life jacket comes with. Above all, it features a heavy-duty handle on the top of the jacket that helps you to easily pick up your little furry friend from water in case of an emergency. During the summer, your dog also needs to take the heat off a little by jumping into the pool. But still you need to ensure complete safety for your pup in or around water. And this Swimways Sea Squirts Dog Life Vest w/ Fin for Doggie Swimming Safety helps you to achieve that easily. It helps the dogs to float in water and helps them to enjoy completely. The best features an adorable fin at the back of the vest that makes your dog cuter and also provides with the ease of mobility in water. It also increase the confidence of your doggie greatly by making it the centre of attraction in the pool. The vest is easy to apply since all you need to do is to connect the right leash to the metal ring. Lastly, the vest has been manufactured from highly durable fabric thus it will serve your dog for years to come. 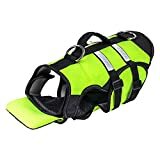 If you are looking for comfortable yet heavy duty life saver jacket for your little furball then this Prumya Dog Life Jacket Pet Life Vest Saver is a worthy choice that you can make. It comes with sturdy grab handles that helps you to get your dog out of water at the time of necessity. Plus, the belly buckles and adjustable chest straps makes the vest easy to fit. The life jacket comes with an upgraded design along with bright orange colouring and reflective strips for better visibility. Furthermore, it has a D-ring attached to it which helps you to swim together with your dog easily. Most importantly, the vest comes in all sizes thus you will not have to worry about size any longer. 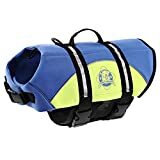 The EzyDog Doggy Flotation Device Dog Life Vest Jacket is one of the best floatation devices for pets available in the market that comes with the assurance of utmost performance. Coming with DFD design and high performing materials, this life vest provides your dog with comforting fit. Plus, it features an adjustable grab handle that enables you to take your dog out of water at any time. Moreover, the reflective detailing on the vest provides the vest with great visibility as well as great security. It seems like Paws Abroad has some of the best life jackets in the market. This life jacket for dogs from Paws Abroad serves as a testament to their extraordinary craftsmanship. Manufactured from high quality neoprene, the life jacket is highly durable and serves your dog for a long time. Plus, the nylon straps provide it with ease of fitting and security. 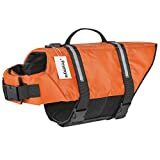 Moreover, the life jacket comes with reflective strips that offers better visibility and the handle for exit makes sure that you can retrieve your dog from water any time you want. The WOpet Dog Life Jacket sits atop our list for a reason. It is the best one that you can get in the market today. With handle on the top, this jacket makes sure that you get to retrieve your dog as quickly as possible during the time of emergency. The reflective accents and strips makes sure that the dog remains visible always. Plus, the adjustable straps as well as quick release buckles ensure perfect fit for your dog. Your adorable furball also wants to have utmost fun during summer. 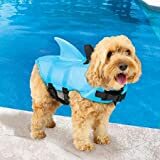 Well, choose the best life jacket for your dog from the list above and have utmost enjoyment with your dog to cool off the summer heat.